Listen to Electronic Intifada’s latest podcast on the ongoing Israeli attacks on the Gaza Strip. -15, you’ll hear me screaming as an explosion happened nearby that lightened the dark sky into red. This podcast will help you have a glimpse of what’s going in Gaza. 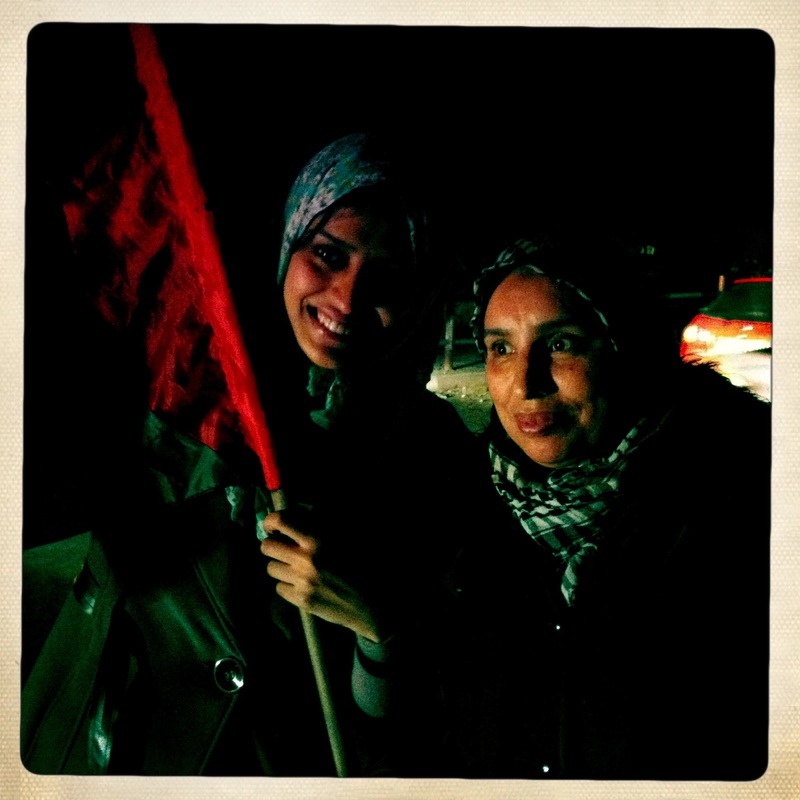 Listen to my podcast on the Tunisian International radio, reporting on the third day of Israeli attacks on Gaza. I have no time for well-written blog entries but I report constantly on my facebook and twitter accounts. All posts on fb are public. Feel free to subscribe. You can also follow me on twitter for more updates. Follow this post where I write the names and ages of the killed people during the past days of the ongoing Israeli attack on Gaza and the circumstances of their killing. A man and a woman from Al-Dalou family were found buried beneath the rubble on Thursday, November 22, after three days of their death. Israel committed a massacre against Al-Dalou family on Monday. The paramedics managed to pull out ten dead bodies in that attack (Check the list from 54 to 64) The death toll in this single massacre rises to 12 people. Ahmad Abu Momseh, 10 years old, injured as an F16 warplane attacked a group of civilians in Maghazi camp, central Gaza Strip.Zaki Saeed Mohadadah, 42 years old. Jouda Sulaiman Amran Shamallakh, 30 years old. After the truce was endorsed at 9:00 pm on Wednesday, Israel has violated the truce killing Anwar Abdelhadi Qdeih, 21 years old, as the Israeli Occupation Forces started shooting at the farmers in the southern Gaza village of Khuzaa, close to the buffer-Zone. Nineteen other Palestinians suffered gunshot wounds. our dignified martyrs didn’t go in vain. Women, men, children and elderly people are still outside, uniting their voice, cheering for the victory that our freedom fighters accomplished. Wow! I can’t believe it! The past 8 days of Israeli attack on Gaza was like a nightmare. But as I look back, recalling my observations of my people’s resilience and steadfastness, I become more proud of being a Palestinian. We never complain about our suffering as we have faith that this ongoing suffering is just a price of freedom of the land and the human. We have faith in our just cause and we are willing to pay any price for justice to prevail. As negotiations about ceasefire is going, more bombs fall over several places in the Gaza Strip killing a 14-year-old Nader Yousef Abu Mghaseeb and injuring at least 7 people. Death toll in Gaza rises to 161 now, including 42 children. 1250 people were injured in the past 8 days of Israeli attack on Gaza. According to the minister of health, more than 75% of the injuries were women and children. Even if the ceasefire ends up being true, we will never forget those 161 victim killed in Gaza and we’ll never forgive Israel for this massacre. We’ll bring justice to these souls sooner or later. Abderrahman N’eim, 6 years old, killed at around 3 pm as Israel attack Ne’ma building that contains several media offices and is inhabited by many families and surrounded by many densely inhabited building. He’s a son of a medic who has been continuously working in Shifaa hospital since the Israeli attacks on Gaza started. He didn’t have time to see his son during the past 8 days and his son finally arrived to him as a dead body drowned with blood. He stayed solid, bent over his dead son with dignity, kissed his forehead and said “Al-Hamdullah” Thank God. RIP dear Abderrahman. Israel will pay the price to every crime they committed sooner or later. Israel just committed another massacre against Al-Assaly family who live in our neighborhood, killing the father Talal Al-Assaly and his son Ayman and daughter Hadil. Death toll in Gaza rises to 149 and still rising. I’m sick of updating this blog. Do whatever you can to stop this mass killing! On the seventh day of the ongoing Israeli attack on Gaza, 35 were killed. Two of them are still unknown for they reached the hospital as charred pieces. Death toll rises to 143, including 30 children. Still rising. Just heard 8 continuous huge bombings in my neighborhood that shook the house. I felt like I lost my breath out of fear. This horror has to stop. This mass killing has to stop. Check latest update of names/ages of victims. Within the past 2 hours, Israel committed another massacre against the people of Gaza killing at least 14 people, including two children who were killed while playing football in front of their house in Zaytoon.. Many of those killed are still unknown for they were found torn to pieces. The Israel aggression on Gaza is going. More bombs are falling over us and more innocents are being killed.. Check this blog of the list of names and ages of the people killed on the seventh day of Israeli attack on Gaza. The past 4 hours were very scary.. Bombings were crazily continuous. Warplanes were targeting everywhere from the north to the south. Still bombing.. And more are being killed. As negotiations about making a truce is going, Israel went crazy to kill an many people as possible. Within less than 2 hours, 18 people were killed, including two children playing football in front of their house. Many of those killed in the past few hours are still unknown. They were arrived at hospital as pieces. 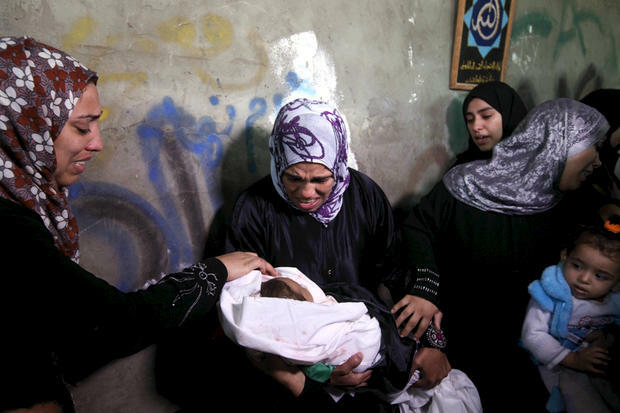 With the killing of Musa Abu Eisha, death toll in Gaza rises to 135. Very atrocious massacre is going here. Israel is threatening of escalating their ongoing crimes against the people of Gaza and threatening people to leave. 4 thousand people have already left their houses to UN schools. Just saw a report on TV on those who evacuated their houses. Children, women, elderly people were crying. It was heartbreaking. Don’t sit and watch. Act for the sake of humanity. The least thing you can do might contribute a little to end our suffering soon. Oh God! Israel just committed another atrocious massacre against Azzam family. It seems Israel is still thirsty for more blood of innocent, even after they have sucked enough already. Wasn’t what happened to Al-Dalou family earlier satisfying enough? 11 people were murdered in Al-Dalou massacre, including 3 children and 4 women. An Israeli warplane just rocked Azzam family’s house in Zaytoon area while sleep88ing peacefully at night, killing three, including a 19-year-old woman, Nisma Abu Zour, and a 5-year-old boy, Mohammed Iyad Abu Zour, and a 38-year-old man, Ahed Al-Qattaty. At least 40 got injured in the same attack, including 15 children. Medics are still pulling injuries from under the rubble of the house. 3 of the injuries among children are very much under the threat of death any moment. Why if Israel knows exactly who inhabits the house they are targeting before they attack it? Why to target children and women? Or is it just a desperate desire for spilling more of the Palestinian blood? The more you stay silent, the more Israel escalates their inhumanity and kill more innocents. They get their immunity from your silence. Act now! Feeling so enraged. The images of the bodies can’t leave my head. Crying and screaming, but not out of sorrow, but out of anger and frustration. Why is the world still watching? Criminal Israel is continuing to massacre us. Al-Dalou family were just massacred. 10 people were buried under the rubble of their house. Why did they target this family? No reason. Israel is targeting randomly. Innocents are being killed. Five members of the very same family were murdered: the father Mohammed Jamal Al-Dalou and his four children Ranin, Jamal, Yousin and Ibrahim, and his elderly father Jamal Al Dalou. Another three women from the extended family also died, Suhaila Al Dalou, Samah Al-Dalou, and Tahani Al-Dalou. Moreover, two neighbors, the 83-year-old Ameina Matar Al-Mzanner and Abdallah Mohammed Al-Mzanner, were also killed in the same raid. What did those people do to deserve being murdered in such an atrocious way? Their bodies were torn to pieces, drawned with their blood. Is this also self-defense? What kind of threat do these children, women, and the elderly form against Israel? Why is the world still silent? I almost burst out. I couldn’t tolerate what happened to Al-Dalou family. As I was watching the sad and ugly scenes of the dead of injured, unconsciously, I started running like crazy in the house, screaming, and crying very hard. Mum started calming me down as she was silently crying. I could find my strength again inspired by my faith in our just cause. We die to live freed and dignified. Israel will pay the price for all these crimes against my people. No matter how bloody they get, we’ll never give up. We’ll keep fighting and sacrificing whatever we can until freedom. Justice will be done and Israel will never get away with their crimes. The crazier Israel gets, the bloodier and more inhumane they become. Enormous explosions and continious bombings have been on-going for the longest I’ve ever witnessed since the attacks started on Wednesday. The sky has also meant beauty and purity to me. However, Israel has shifted the sky from being a sourse of inspiration and relaxation to a sourse of horror. The warplanes have become indscriminate; shelling houses, TV offices, motobikes, empty lands, even poultry farms. As I’m hearing explosions in northern Gaza, people in central Gaza and southern Gaza are also hearing exactly the same. They are rocking everywhere, at the same time, and they don’t care where they’re targeting. They never think who is being harmed. Tonight, civilians, including children, women, the elderly and journalists have been targeted. A little earlier, Israel just shelled Qdeih family’s house, killing another woman, Samaher Qdieh. Soon after that, Israeli warplanes shelled another house in Shaboura Refugee camp injuring 6 people, including 4 children. Israel has just bombed two houses in northern Gaza, killing two children: 1-year-old Gumana Abu Sufian and Tamer Abu Sufian. In the same attack, at least 13 got injured, mostly children and women. They also targeted Al-Quds TV office in Gaza, leaving at least 5 injured among the journalists working there. The photographer Khader Al-Zahhar has lost his leg in this attack. It seems that the Israeli war against Palestinian journalists has started. They form a serious threat as they are the tongue of truth who are dedicated to cover the ongoing crimes that Israel commits against the people of Gaza and humanity 24/24. Till now, airstrikes can be heard all over Gaza. The Israeli navy is still firing rockets against houses along Gaza’s beach. The sound of warplanes are getting louder and closer. More attacks are coming. Keep your eyes on Gaza. Your prayers and thoughts are appreciated but your actions are more appreciated! Act now and stop this genocide! Israel is escalating its inhumanity and their exceeding all red lines! They moved from shelling empty lands and poultry farms surrounded by civilians houses, to shelling motorbikes and cars, and houses. This morning, IOF attacked Salah and Abu Qarmoot family’s houses turning their houses into rubble. They pulled out at least 25 people from under the rubble, mostly kids and women, all suffering very critical situation. Israel just shelled a house in Rafah that belongs to Qdeih family, leaving another woman, Samaher Qdieh, murdered. Just few minutes ago, Israeli warplanes shelled another house in Shaboura Refugee camp leaving 6 injured, including 4 children. Ministry of health in Gaza: 45 killed in Gaza, including 11 children, 3 women, and at least 500 injured, mostly children and women. At 9:40 pm, Israel attacked Qdeih family’s house in west Khan-Younis, Southern Gaza and a woman got killed, Samaher Qdeih. The number of killed people rises to 45, including 8 children, 3 women, two elderly people. Injuries have exceeded 450, most of them are children and women. Over 50 cases are under intensive care. The Israeli attacks on the people of Gaza are continuing. Bombing are all over the Gaza Strip. Keep your eyes on Gaza and act! OMG! that’s genocide! that’s mass killing!! Israel just attacked two houses in Jabalia, less than five minutes far from my house: Abu Salah family and Abu Al-Sa’ed Qarmoot family. People are buried under the rubble! A child body from Salah family was just pulled from under the rubble of his house. More than 30 injuries, mostly children, have just arrived at Kamal-Odwan hospital in northern Gaza. A women was just pulled out from under the rubble that suffers very critical condition! The number of victims is still rising!! The ambulances’ sounds can be heard everywhere. All I can hear now is ambulances’ alarming and more Israeli bombings! Oh God, protect the people of Gaza!!!! Share!!! A friend of mine just messaged me. Everyone in the neighborhood were falling asleep when they suddenly woke up as the glasses of their house’s windows are raining over them as a result to the latest IOF rocked a governmental ministry few minutes ago, located behind their house in Nasser street. A situation of horror and trauma is spread among people there! There is a total blackout in several places in Gaza. The sound of drones is getting louder. Warplanes are flying on low distances. Keep your eyes on Gaza. Woke up on series of huge explosions in the neighborhood that shook everything in my room! Everyone has woken up. One can hardly fall asleep!! bombings became quieter for a little while. However, unsurprisingly, IOF started firing missiles one after another as the time for Fajir prayer came!! Good timing for more killings as people are going to mosques to pray! More bombings, more attacks!! Israel just targeted a motorbike close to Al-Aqsa hospital in Deer-Al-Balah, central Gaza, leaving one murdered and 2 injured and in another attack, two children got seriously injured. 8 victims of the people murdered in Gaza as a result to the latest Israeli attacks are children, three of them haven’t even celebrated their first birthdays. Over 250 injures have been reported, including 150 children and 96 women. Where are the terrorists you Israeli bastards are targeting! Very sad! What Nasser family went though yesterday as their house was targeted in Sikka, Beit-Hanoon, Abu-Jalala family are experiencing now as a result to the very recent attack on Magazi, southern Gaza. Yesterday, Nasser family lost 3 of their family members including 15-year-old boy. 20 injuries were reported from the same Israeli attack on their house. Six of the injuries belong to the same family, including 4 children and the elderly father whose life is under risk of death any moment. In the recent attack on Magazi, three brothers (Ahmad, Amjad and Ziyad Abu-Jalala) were just killed. I just can’t help but cry imagining how painful it is for their mother to lose three of her sons at once!! Besides, In the same attack, Hassan Abu Hameela got murdered as well.The number of murdered people of Gaza since Wednesday rises to 30, including 8 kids, 3 women, 4 elderly people. Besides, more than 300 are suffering serious injuries, including 150 kids and 96 women.So sad :((( Stay strong Abu Jalala and Nasser family! Stay strong you dignified people of Gaza. The Israeli attacks on Gaza are continuing. A little while ago, IOF shelled a poultry farm in Khan-Younis, leaving a bunch of chicken killed. I just wonder, where are animal rights activists from this horrible crimes. Aside to that, “just a secondary news”, a child and his father got injured. Medics just reported that 24 people weree killed in Gaza since Wednesday, including 8 kids, 3 women, 4 elderly ppl,(AND hundreds of chicken). Moreover, 270 people got injured, over 30 cases under intensive care, including over 150 kids & 96 women. Medics say that the medical equipment and resources are about to run out from hospitals of Gaza. We don’t only have ‘terrorists’ among children, women, and elderly people, but our chicken are the most terrorist! The residents of Israel are evacuating their houses, seeking underground shelters, terrified. Bombings here are non-stop, targeting several places in Gaza and more victims are falling. Just a little while ago, 3 children, a woman and a young man just arrived at Shifaa hospital, drowned in their blood. There is no safe shelters in Gaza. However, we’re still enjoying very high spirit. Very bravely, whenever we hear of more victories our freedom fighters accomplished, we put our pains aside and we start singing and distributing sweets celebrating our victory. The people of Gaza are ready to pay whatever cost Palestine entails for the sake of freedom and dignity. I seriously feel like I’m back to life after death. Feeling excited!! I got sickened of hearing more bombings, killings, injuries and causalities. But now I’m celebrating, singing, and dancing, just like all people of Gaza who forgot about their woos and mourning over the victims and started celebrating this victory of our freedom fighters who just managed to down the third Israeli warplane!! Moreover, a resistance rockets just hit an Israeli settlement to the south of Bethlehem!! Proud!! Go resistance goooooo!! We shall overcome! More attacks are happening at the moment. Our house is shaking. 3 children, critically injured, just arrived at Shifaa hospital in Gaza. The Israeli warplanes are intensively dropping missiles on several places in Gaza now. bombings are sounding louder and closer. More killings and injuries have resulted. The number of killed people have reached 24, including 7 children, a pregnant woman, and two elderly men. Over 300 injuries have resulted from the attacks, the majority are children and women. 30 cases are under intensive care and very much in danger to die. The attacks are continuing and the Palestinian blood of innocents is being spilled by criminal Israel. My father has just left the house to visit his friend’s funeral Marwan Abu Alqumsan who was buried in a very hugely deep crater resulted as an israeli missile hit an empty land northern Gaza. We didn’t want him to leave because Israel can target any place close on his way there, but he promised he’ll be back soon. But I know we’ll only relax when we see him back home safe and sound. Keep your eyes on Gaza. My parents’ friend, Marwan Abu Al-Qumsan, 52, who repeatedly visited our house, was walking on the street back from a family visit to his sister’s house. At the meantime, the IOF fired a missile on an empty land few meters far from him that left a HUGELY deep hole in the ground. Somehow, he fell there and it buried him alive. People kept kept digging for 4 hours to take him out. :'( His brother was walking after him about 20 meters far and he miraculously survived this with several wounds everywhere in his body. I am speechless. Down with this zionist criminal entity of Israel! The IOF just targeted a house in Sikka, northern Gaza. Two brothers were killed and their father is seriously injured :( Now the Israeli tanks are moving forward. The Israeli navy are still firing missiles at people’s houses. It’s gonna be a freaking night. But we’re up to this!! 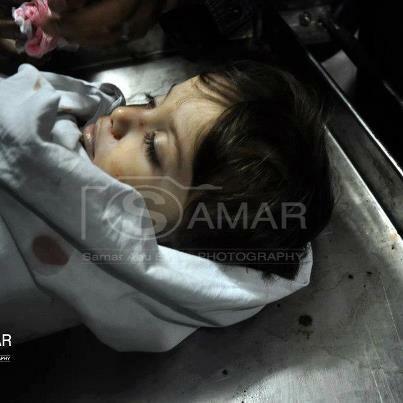 Another child has just made the number of martyrs rise to 15. The number of injuries has exceeded 130 victims, many of whom are children and women. They can care less about the victims harmed as a result to their attacks or the places they are targeting. A little while ago, they targeted an ambulance in Al-Twam area in Northern Gaza. The Israeli missiles are still falling intensively over Gaza. I heard news about ground incursion starting on the borders of the Gaza Strip. The Israeli navy is continuing to fire missiles towards the people’s houses in the Beach Camp. Our sky is intensively occupied with their warplanes. Basically, we are besieged from everywhere by the Israeli Occupation Forces. My eyelids have been struggling to close and rest a bit but it’s impossible in this terrorizing situation for anyone to be able to sleep for longer than few minutes. Just heard two explosions nearby. It felt like our house was going to collapse on us. Hang in there our people. Nothing can defeat your indescribable determination. We shall overcome. Just few minutes ago: We could hear a series of horrifying bombings falling one after another in several places, specifically west Gaza. A total blackout over Gaza followed that. Can’t tell you how terrorizing that was. It sounded very close. Me and Catherine Charrett ran towards the windows and we could see the dark sky lighting red. The ambulances are rushing to the place. I’m tired of writing “More bombings” but they are just non-stop at the moment. Too many, too terrorizing, everywhere! Hang in there my people!!! We’ll come out of this stronger! العزيمة جبااااااااااارة! !